Point Pleasant senior Jacob Roub maintains leverage during a 152-pound match against Huntington during a Dec. 7, 2017, dual match in Point Pleasant, W.Va.
MADEIRA, Ohio — The defending champs didn’t have the power to regain their title. 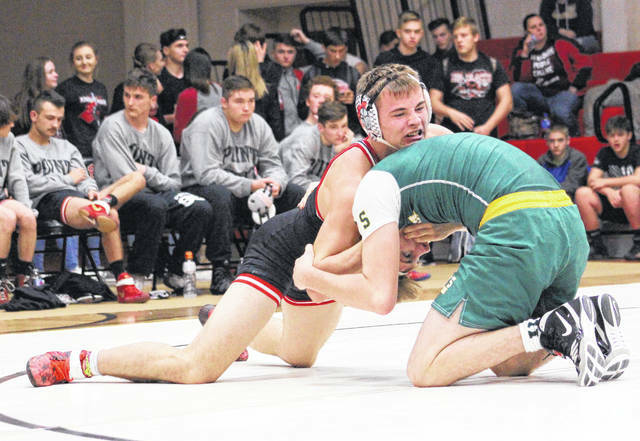 A blown transformer cut the second day of the Bob Kearns Invitational short on Saturday as the Point Pleasant wrestling team ultimately finished as the runner-up based on Friday’s results at Madeira High School just northeast of Cincinnati. The Big Blacks owned a 21-6 overall record and had eight grapplers in semifinal events after the first day, but the power —and heat — went out at the start of the second day’s rounds. The power outage eventually led to the second day being cancelled, leaving PPHS behind only Mater Dei (MD) in the final results. A total of 22 teams took part in the annual event, with Mater Dei claiming the title with 135 points through one day of action. Point was second with 97.5 points, while Bethel Tate (68) and Goshen (52) rounded out the top four positions in the field. The Red and Black amassed 16 pinfall wins in their opening day of competition, which included eight unbeaten wrestlers — all 2-0 individually — facing semifinal matches. Justin Cornell (106), Isaac Short (113), Mitchell Freeman (126), Jacob Roub (152) and Juan Marquez (195) each earned a pair of pinfall victories in their opening two matches on Friday. George Smith (120), Zac Samson (145) and Jacob Bryant (170) also had a pinfall win apiece in their opening two bouts. Riley Oliver (132), Clayton Hill (182) and Wyatt Stanley (220) also scored pinfall wins in their opening contests before losing their second matches on Friday. Point Pleasant returns to action on Thursday when it hosts Athens in a dual match at 6 p.m.
Visit baumspage.com for complete results of the 2018 Bob Kearns Invitational held Friday at Madeira High School.